Recently I've taken to shopping in Superdrug more. It's not that I've disliked Superdrug in the past, far from it, but my go-to has always been Boots. But with brands such as Makeup Revolution and B. in Superdrug, not to mention my favourite Colab Dry Shampoo, I've been shopping in there more than ever. Side note - This was actually just going to be a 'Current Beauty Favourites' post but then I realised all the products can be found in Superdrug/they're all exclusive to Superdrug. So yes... not sponsored in the least, it just turned out that way... because I'm clearly loving brands than can be found in Superdrug! First up possibly the prettiest makeup product on the high street right now! Just look how lovely this product is... certainly one to display on your dressing table. For me this is a versatile highlighting cream as I use it in quite a few ways. Firstly when I'm wanting a light glowy coverage from my foundation I mix my foundation with a pump of this and apply it over my face with the Real Techniques Sponge, this not only glides on but gives such a light and fresh look to the skin. However when I'm wanting more coverage I apply this all over the skin as a base and then apply a medium coverage foundation, this allows the highlighter to still give the skin a nice subtle glow. Then you can also apply this to the brow bone, cupid's bow and the tops of the cheeks to add a more intense highlight. As this has a serum consistency I find it to be so lightweight and silky feeling. Just an all round lovely products! Also not sure if this is a solely online offer but selected products from the B. range are now half price on the Superdrug website, making the serum £7.49 - very affordable!! This was a palette I received with the Latest In Beauty Pre-awards box and I will admit I was thinking it wouldn't be up to much! But I was wrong to judge so quickly as this has come in handy quite a few times. Now not all of the shades work for my personally but I've been enjoying using 3 of the 5 shades in the palette which isn't bad. My most favourite it the green corrector that neutralises redness, this has come in handy for around my nose and chin area and on my cheeks where I have some natural redness. The consistency it what I thought would let it down but it's actually quite a light cream that melts into the skin. I also like to use the middle shade to lighten areas of my face before applying foundation - mainly the tops of my cheeks and under my eyes. I wouldn't say that it's a highlighter as such but it definitely brightens. Then lastly I'm been enjoying using the lilac corrector that helps to mute yellow undertones in the skin, this is great around my mouth/chin area as my skin can sometimes look sallow which makes my foundation look darker in areas so this has helped! 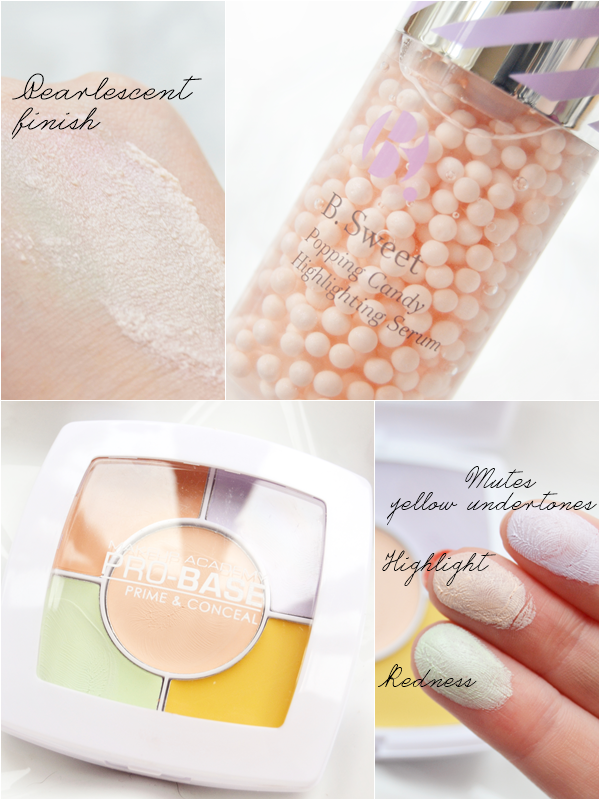 This really is a handy palette and definitely one you will find a few useful correctors with whatever your skin needs. 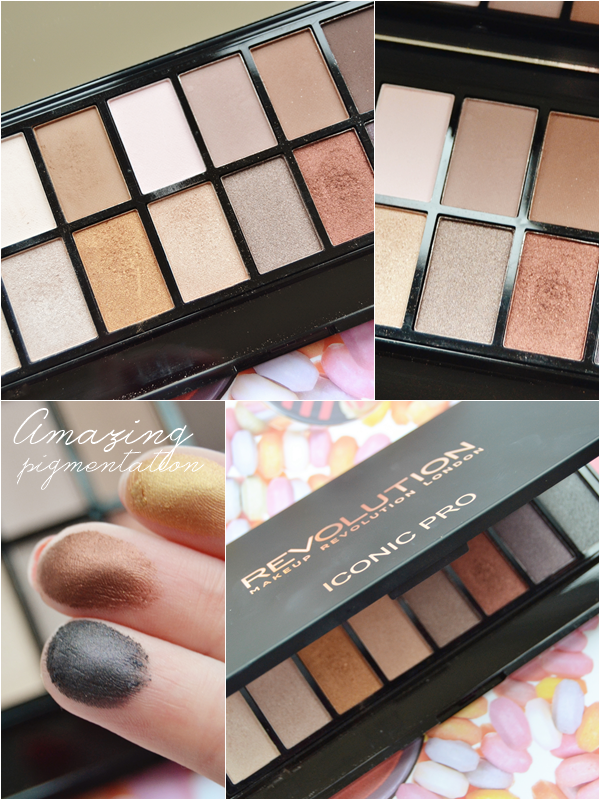 Ahhh Makeup Revolution palettes, how I love you so. This wonderful palette contains 8 matte and 8 shimmer shades all of which are highly pigmented and very bendable. As a lover of a smokey eye I was instantly drawn to the warm toned shimmer shades which are just stunning, I mean just look at my little swatches above, that middle shade especially! I've also been loving some of the lighter shimmer shades as a base for eyeshadows and in the inner corners of my eyes. As for the matte shades there is a little more fall-out and you do have to blend them slightly more but the shades are truly lovely and so soft looking on the eyes. This is just such a versatile palette that you can create so many eye looks with and even fill in your brows with! You will also be blown away by the quality of the eyeshadows - buttery perfection! I have a feeling the Iconic Pro 2 palette will be purchased soon. Here's quite a new release and one I'm loving right now - the Gosh #Foundation Drops (don't like the hash tag thing). This is a wonderful very fluid foundation that slips over the skin a dream. Due to this it's very light in coverage but that can easily be built upon to a good medium coverage. Initially with the foundation slipping over the skin so lovely I imagined this would be for drier skin types but I was wrong... this works so well with my combination/oily complexion as it neither clings to dry skin areas or looks oily around my T-zone. This also stays well for most of the day. As for the little pipette dropper I really feel this was such a good idea as the foundation is far too runny to work with anything else and the pipette can be dropped straight onto a brush or sponge or even mixed with an SPF or moisturiser in the back of the hand. As for the shade 002, which is the lightest shade in the range it does have a slight yellow undertone to it but as it's sheer I can get away with it and it's a pretty good match for my fair skin... though sadly maybe not in winter. The only let down here is that the range consists of only 5 shades?! Last but not least another total favourite from Superdrug. I feel like I may be starting to sound like a broken record but this is truly one of my favourite hair products of 2015 and something I know I will be purchasing for as long as it stays around - hopefully forever! Unlike a lot of other dry shampoos this doesn't give me an itchy scalp or feel like there's a product build-up if I over do it. The range also comes with some really great scents, my favourite of which are Rio and Monaco, both are fresh and actually not too synthetic smelling! I know there are so many dry shampoos on the market now but this really is the one I'd recommend to everyone. 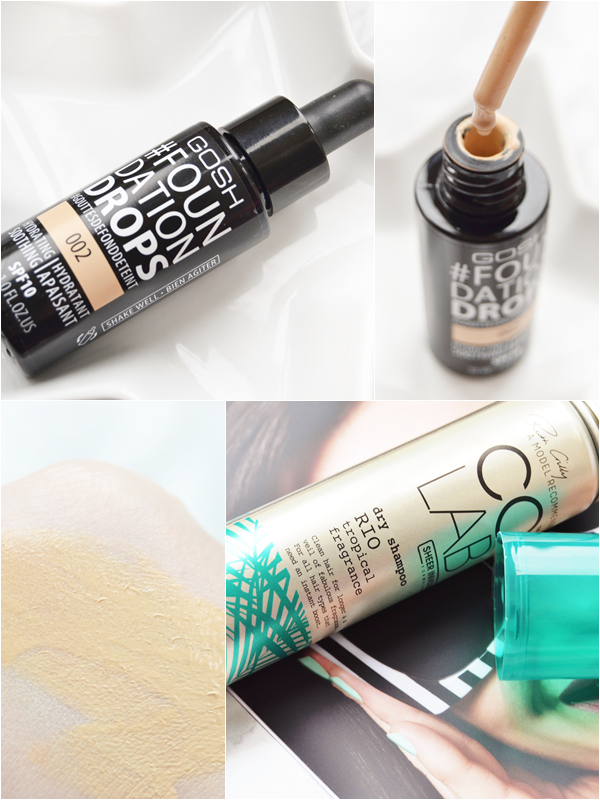 Hope you've enjoyed discovering what my current beauty favourites are! 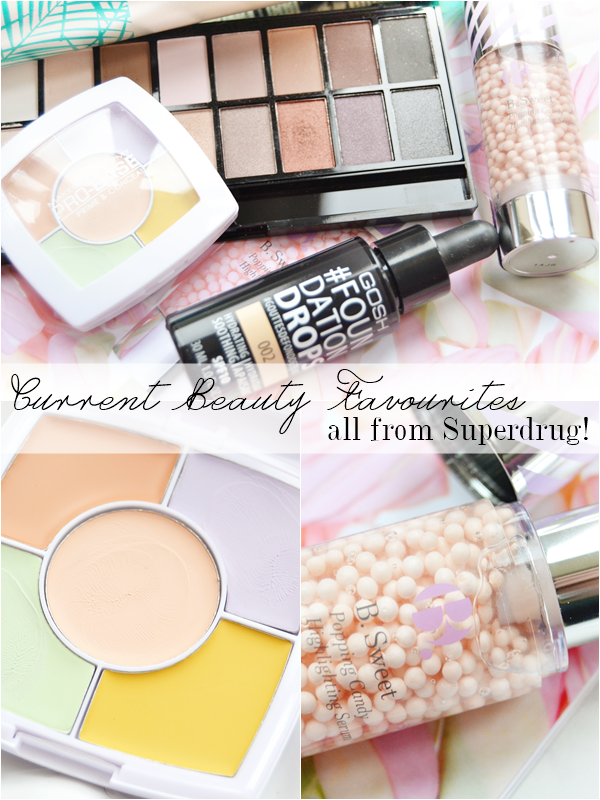 What brands do you love in Superdrug?